These are some of the socks I’ve made in the past four years. I don’t know what I’d do without one or five pairs of socks going on. I love knitting round and round on little double pointed needles, and I love the little collapsible square that is a sock in progress. They’re small and portable, and as challenging as I want them to be. They’re endlessly entertaining to knit, even when they don’t go according to plan. Their patterns can be as simple as stockinette, or as complicated as lace and cables. They’re loud or quiet, according to the yarn I choose. They’re warm and cozy all winter, and just knowing that there’s a pair of my own wool socks on my feet makes me smile. And when I look down and see these beautiful, varied colors, why, I smile even more. And if S is for socks, then it’s also for Soctoberfest! My next pair of socks will be in the Petals Collection Hydrangea colorway. Instead of the textured spiral pattern that was written for this beautiful purple-y yarn, I’m going to try something a little simpler. I need simple and soothing knitting this week. So I’m ready for the sock celebrations — how about you? That’s the sort of picnic I can get behind – lovely! It just seems so much easier to get socks to go right than, say, a sweater, doesn’t it? Oh yes! I feel so magical when I have on my own socks. Sweet dancing feet in cozy snug socks.How I love your photography, dearie. It’s always both interesting and beautiful. what a great basket full.and I totally agree with the love for sock knitting. everything about them is fun.how are you enjoying your wheel? What a nice basket of socks. I put on a pair of my wool socks the other day. They felt wonderful on my feet. I almost always have socks on the needles. 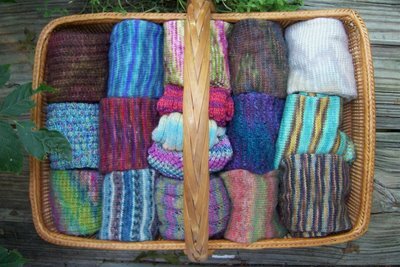 What a great basket of socks!